A new webboard design: critique? Now that I have defended my Master Thesis, I “only” have three exams to prepare (one of which is basically a 15-page paper). As such, the Master Thesis was by far the largest work to be done for university, and I therefore took a small break from working. That break turned out to be spent on another kind of work, web design. In July, I will normally become the administrator for our Law Faculty student webboard & website, and I grew somewhat tired of the Cobalt theme for phpBB2, which is currently used. I therefore got to work on another design, something fresh. The result is a working board on www.arpia.be/droides/, only a test so far. 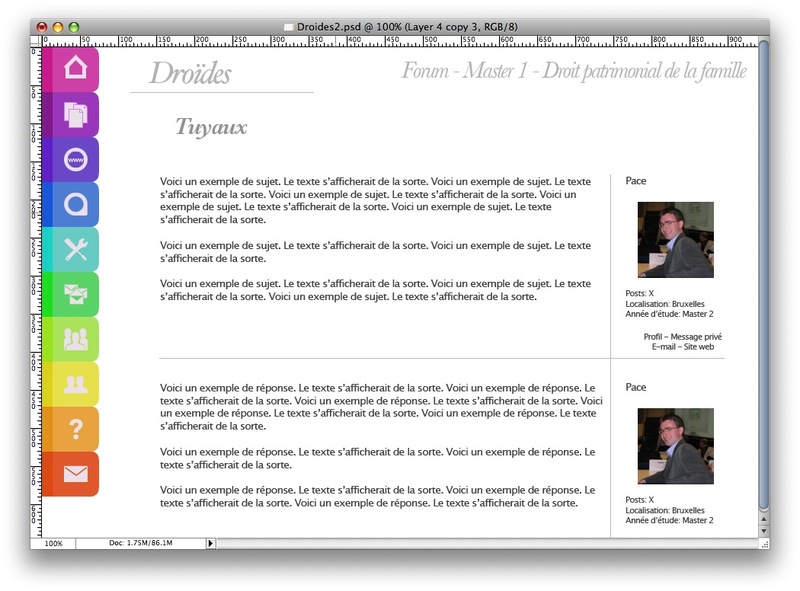 The board is in French, but I’m looking for feedback on the general design, which shouldn’t require a great deal of linguistic skills. There’s a test user, “Test”, with the password set as “testpass”. Anything that desperately needs changing? Suggestions? …? 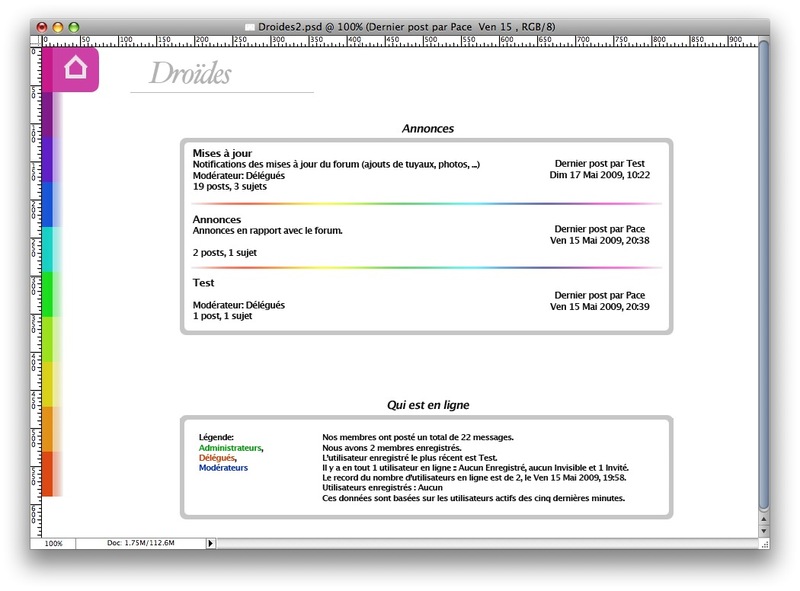 There are two working themes, and you can switch between them in the footer (“Droïdes – Droïdes2”). Just click, and a whole new layout appears. Oh ok, I thought that the theme completely changed when logging in. Now it’s good. I know, I know, but I can’t think of any other way, apart from a choice when browsing the boards as a guest, to make that difference less “shocking”. 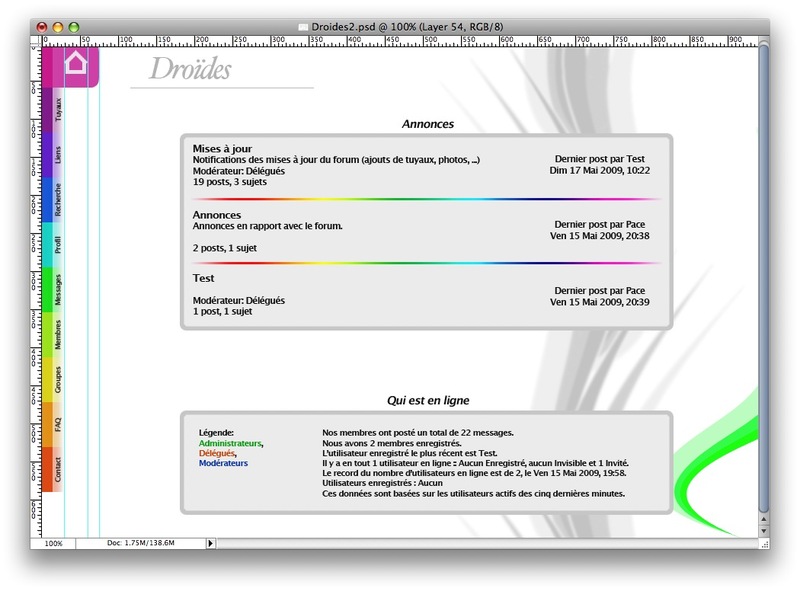 Edit: to clarify, the “second” theme is only like that for me and for that “Testeur” user. “Test” still has the normal one, and guests see the first design too. As it stands, the default theme is the “first” design, but if users wish to change, they can choose to do so in their Profile control panel (and/or when registering). I am surprised by the design difference between the “online” and “offline” status. I mean, when you log on, the forum is totally different. It is very strange, I never saw that elsewhere. IMHO nothing should be added to the background. All right, I have completed a first working version of the theme, but I haven’t yet dared test it in IE (basically, there’s a huge chance that half the layout will look abnormal in Internet Explorer right now – I’ll fix that only if the solution in general seems to be good). 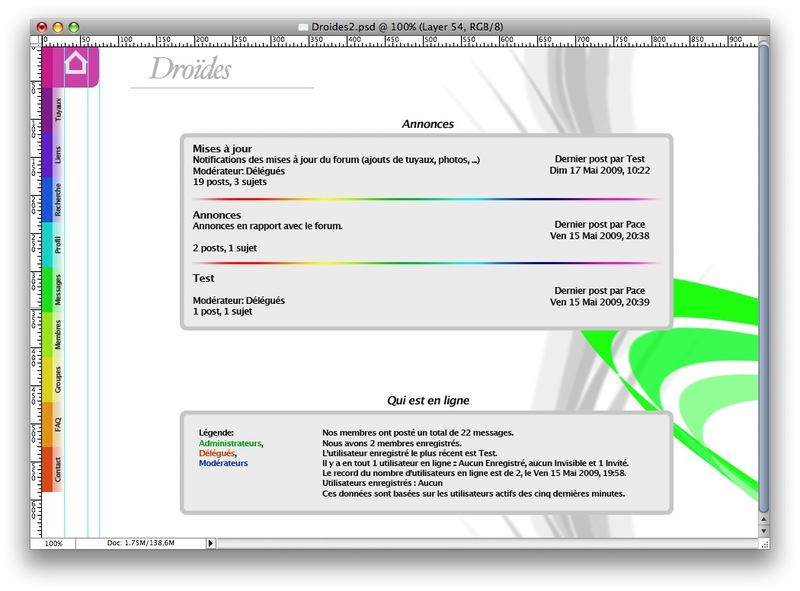 The design is “live” on http://www.arpia.be/droides if you log in as “Testeur2” with, as a password, “testeur”. I was wondering, however, whether I shouldn’t add something else to the background of the design, a fixed image in the bottom-right corner. As such, any ideas on this and/or this? First, I have to fix the “first” design for IE, because I made some changes in the code and it kind of confused IE. Once that is done, I’ll start to implement the “second” design. The idea would be to give people the choice between the two designs, because I’ve received varied feedback on the matter. You’re getting very close to the end ! And how about a background to this effect then? Here’s a version with text on the side. The idea would be to have the sidebar of version 3, but with tooltips (those titles that appear when you hover) to show what they represent. Perhaps there could be text on the side of the button, the one that remains visible. The purpose of the sidebar is to navigate between different sections (user profile, forum, …), not within the forum itself. The forum navigation is basically text-based, like all phpBB fora. It’s just that the “non-forum” pages can be accessed through the sidebar instead of the usual icons and/or text (the ones on the current Droides board, for example). Grey horizontal bars seem to be too… grey. I haven’t found a grey I didn’t find dull for this purpose. Ok, I looked at your links. – what is the purpose of those side buttons ? Navigate through the categories ? But the “side system” doesn’t seem to allow for a hierarchical navigation like the phpBB fora, or turns it into a hassle. – how to spot which button does what ? Especially if the sidebar is discrete like in ex. 3 (which I prefer aesthetically and fonctionnaly since it’s non-obstrusive). Also, I find the color scheme too … colorful. Maybe less saturated colors and grey horizontal bars would do. And here’s version 3 of the “PlaygroundBlues”-inspired design. Or should I try doing as implied by Jaca, i.e. trying to integrate the sidebar in the first design? However, I will say that the reply button needs to be moved to the bottom of the page in topics so users don’t have to go to the top of the page again in order to reply to a topic once they’ve read it all. Yes, I know it takes all of two seconds to scroll back to the top of the page, but that’s where the button is traditionally. Forum/home, “Tuyaux”, links, search, profile (if registered – “register” if unregistered), private messages (if registered – “connect” if unregistered), member list, user groups (if not admin – connect to admin panel if admin), FAQ and finally contact. Okay, here’s a first try at a sidebar in the same vein (haven’t finished all the glyphs, hence the unfinished character). I’ve kept all finished glyphs visible to give an idea of what it could look like. Eugh, I’ve just noticed how horrible the screenshot is. Rest assured that in “real life”, it’s far better quality and the search button is more legible. 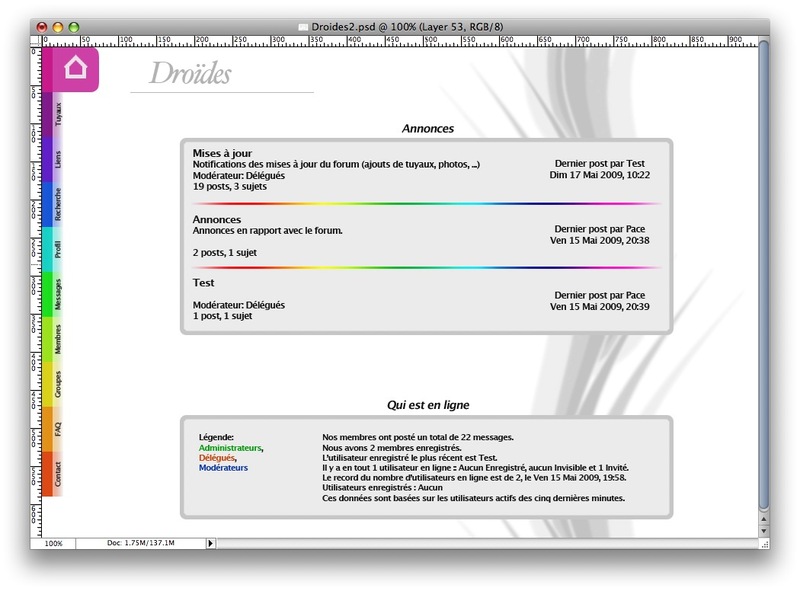 Legend: from top to bottom: home (+ webboard), “tuyaux”, links, FAQ, search. The main body would probably be closer to A List Apart and Authentic Boredom, i.e. putting the accent on text and typography. Hrm… I’m certainly not a fan of the second design. How about something simple like Playgroundblues? Actually I meant that grey can be nice, an the current Aqua interface is a good example of that. After a very quick search, I think that this (http://www.themesnap.com/theme-demos/publisher-theme/forum) is the kind of light theme that could fit. One former class representative of BAC 3 told me it could do with brighter colours, so I’ll definitely take a look at increasing luminosity. According to you, it should be more “Mac-like”, is that it? The current theme is too ‘claustrophobic’. Waiting for that revolution !